Thank you to everyone who nominated for Twenty in Data and Technology 2018. 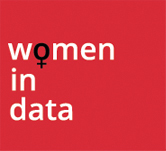 This programme is a joint venture between Women in Data UK and The Female Lead. The Female Lead is developing the showcase – videos, photography, brochure – and we look forward to announcing the Awardees at Women in Data UK. The honest commentaries from last year’s Twenty was a breath-catching moment in the history of WiD UK. We fully expect this year’s Twenty to carry on the great work of 2017’s fine ambassadors and act as role models for women at all stages of their careers in data and technology.